Breakfast is the most important meal of the day … did I say this already? In our last two posts, Breakfast Time and Breakfast Time … Part 2, we spoke a little bit about why breakfast is important, such as starting your metabolism and setting your blood sugar right for the day. I was looking at some recipes and came across another good breakfast idea for those days when you are running out the door. 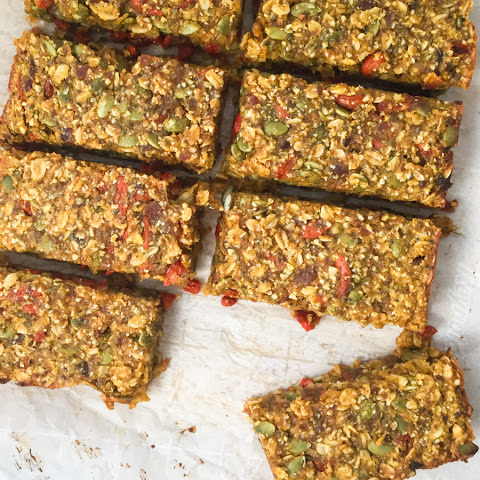 These breakfast bars are easy to make and easy to carry. They are also perfect to carry with you for a late morning or afternoon snack. I like the versatility of these bars as well. You can make them with any nuts or seeds that you prefer and also change the dried fruit to change the whole taste of the bar. I hope you’ll enjoy them! Preheat oven to 350 degrees. Use a blender or food processor to grind nuts, grains or seeds to desired consistency. Mix the nuts, seeds and/or grains in a large bowl. In a separate bowl combine fruit, fruit juice or puree, oil, vanilla and egg or replacer. Pour over the dry mixture and stir to make a stiff batter – you may need to add more water or juice. Spread mixture into a lightly oiled baking pan. Bake for 30 minutes. Cool. Cut into squares when done. This entry was tagged breakfast bars, breakfast time, coconut nectar, gluten-free.